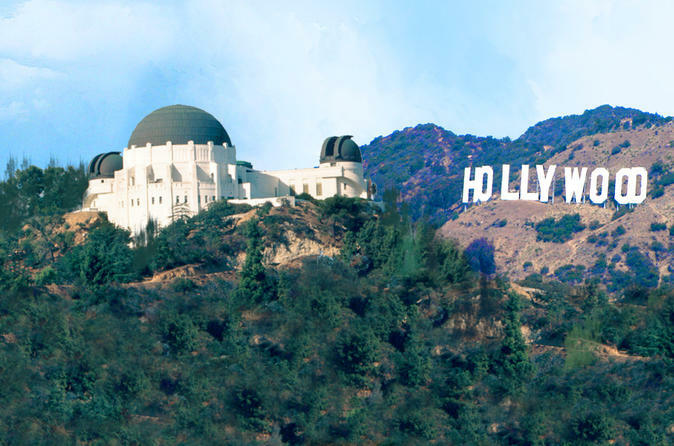 Feel the magic of Hollywood and experience its unique history! See moviemaking landmarks, famous film locations and hear fun stories of celebrity lifestyles and LA LA Land Culture. From the stars on the world famous Walk of Fame, to historic Hollywood studios, restaurants and hotels, to legendary comedy and music clubs. Learn about the real Hollywood, both past and present, narrated by our knowledgeable and entertaining tour guides. See the attractions while you are on your Hollywood vacation. This is the most fun bus tour of Hollywood! Hotel pick-up for REGISTERED HOTEL GUESTS in Hollywood, West Hollywood, North Hollywood. $10 pickup fee for Downtown, Mid-Wilshire, Beverly Hills and Century City area. Start your tour of Hollywood either from the 9:30am departure (in an open-top bus) or 12pm departure (air-conditioned mini-bus). From there, you'll start your 3.5 hour tour of the fabulous highlights of the town. On Hollywood Boulevard, look for your favorite celebrity handprints at the TCL Chinese Theater. Search for your favorite celebrity's Star on the Hollywood Walk of Fame. See Madame Tussaud's Wax Museum, Hard Rock Cafe, Capital Record, Egyptian Theater and the new home of the Oscars, The Dolby Theater, and many other fun attractions along world famous Hollywood Boulevard. The tour operator is the only tour company located right on this boulevard, and all of their tours begin at this fabulous location. From there, go inside Griffith Park from high above Los Angeles. Have your picture taken in front of the world famous Hollywood Sign while also seeing spectacular city views. Don't leave the city without these memorable moments because no trip to the City of Angels is complete without a great picture of the Hollywood Sign. Tour Beverly Hills, Bel-Air, celebrity homes and more. Visit the beautiful mansions, night clubs on Sunset Strip, (the Whiskey A-Go-Go, the Viper Room, the Roxy, and Chateau Marmont), and the most expensive shopping street in America, Rodeo Drive. Please note: tour hours do not include hotel pick-up & drop off time, and tour routes are subject to change due to city driving conditions.